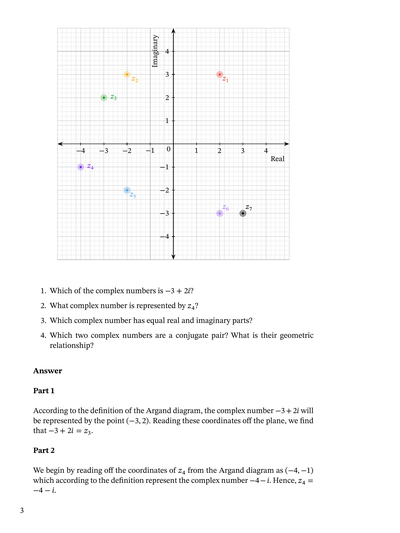 In this lesson, we will learn how to identify complex numbers plotted on an Argand diagram and discover their geometric properties. Find the value of 𝑍 given 𝑍 on the Argand diagram below. Given that the complex number 𝑍 is represented by the point ( − 4 , − 4 ) on the Argand diagram below, find | 𝑍 | . What does the modulus of a complex number represent? 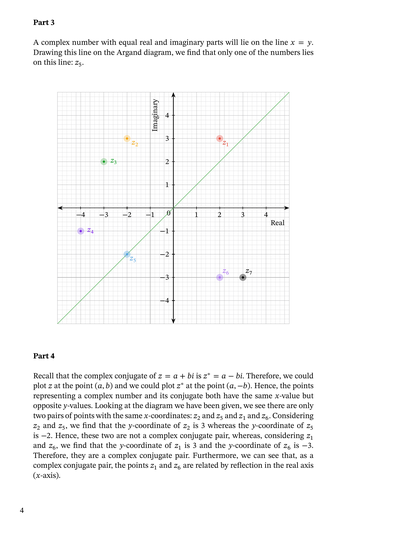 What complex number lies at the midpoint of 𝑧 1 and 𝑧 2 on the given complex plane? Describe the geometric transformation that maps every complex number 𝑧 to its conjugate 𝑧 ∗ . In what quadrant does 𝑧 ∗ lie? Find the value of ̄ 𝑍 given 𝑍 on the Argand diagram below. 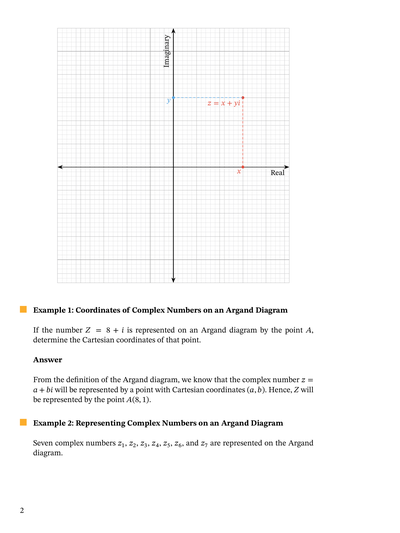 If the number 𝑍 = 8 + 𝑖 is represented on Argand diagram by the point 𝐴 , determine the Cartesian coordinates of that point. Describe the geometric transformation that occurs when numbers in the complex plane are mapped to their sum with . 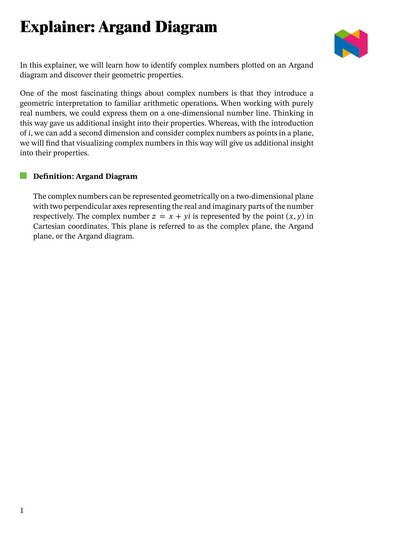 Using the Argand diagram shown, find the value of 𝑧 + 𝑧   . The numbers in the complex plane are mapped to their product with a particular complex number 𝑧 . Given that this transforms the complex plane by a dilation with centre the origin followed by a rotation by 𝜋 radians about the origin, what kind of number is 𝑧 ? Consider the complex number 𝑧 = 3 − 𝑖 . Find the modulus of 𝑧 . Hence, find the modulus of 𝑧 5 . Find the complex number 𝑧 such that 4 + 3 𝑖 lies at the midpoint of 𝑧 and 3 − 4 𝑖 when they are represented on a complex plane. Given that 𝑍 = 9 + 3 𝑖 , find the principal argument of 𝑍 rounded to the nearest two decimal places. Find the possible real values of 𝑏 such that the distance between the complex number − 6 + 7 𝑖 and the complex number − 3 + 𝑏 𝑖 is 5. Given that 𝑍 = − 5 + 9 𝑖 , find the principal argument of 𝑍 rounded to the nearest two decimal places.